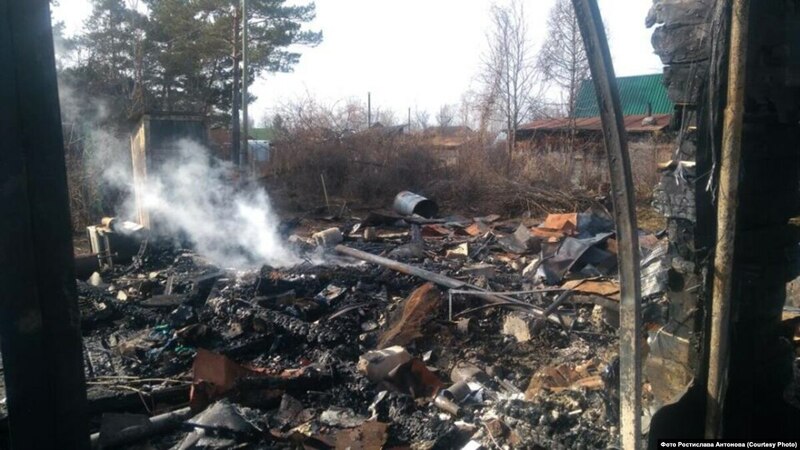 NOVOSIBIRSK, Russia — The leader of a consumer-protection group in the Russian city of Novosibirsk says an arson attack has destroyed his summer house. Activist Rostislav Antonov told RFE/RL on April 17 that a man suspected of setting the dacha on fire a day earlier had been apprehended and identified as a former convict. There was no immediate comment from police. Antonov, who heads a group called Civil Patrol and is a vocal critic of Novosibirsk Mayor Anatoly Lokot, said he believed the attack is linked to his organization’s work. Antonov said that earlier this year a volunteer working for Civil Patrol was violently attacked by unknown assailants. Separately, Antonov said that on April 7, several people entered a colleague’s apartment, threatened to beat him up, and seized pages from Civil Patrol’s newspaper containing a report on a local businessman. Civil rights activists and journalists who seek to expose corruption or question the actions of the authorities often face pressure from Russian officials and influential business people. Activists say the problem is particularly severe in provincial Russia.